Ink and Spindle begin a great, distinctly Melbourne type of business located about 10 minutes from our offices in the popular ‘creative’s hub’ of Kensington. They are designers and makers of gourmet, screen printed organic, enviro-friendly fabrics that end up in all sorts of places – upholstery, handbags, curtains, you name it! Lara Cameron is one of the designers and also does her own personal design work. Just recently she commissioned us to undertake some new personal printing work for her printing on Hahnemuhle’s gorgeous, eco-friendly archival paper, Bamboo. We're asked about calibrators all day long. And one of the most common questions is - Spyder5 vs. i1Display Pro? Which is the best, and why? We'll compare only the latest models - the Spyder5 and the i1Display Pro. The Spyder4 and all Spyders before it are not even close to the same class, and neither are the older i1Display V1/V2 units. If you're still using one of those (or you've got one in a drawer you're not even using! ), it's time to upgrade - modern calibrators are all vastly better than these older ones and well worth the investment. 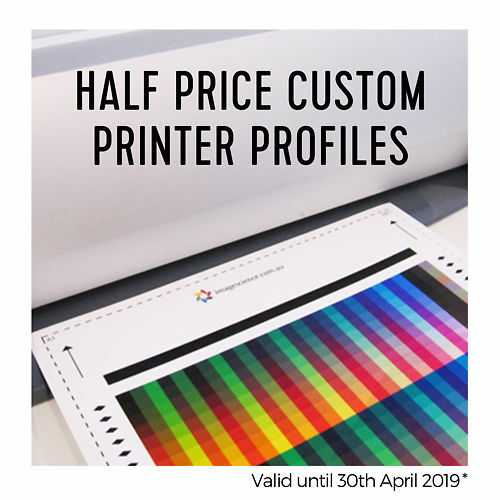 As a rule, we recommend most folks buy an excellent monitor calibrator and (if they're doing their own printing) - use our custom profile service to make profiles for their favourite papers, as opposed to buying calibrators which can handle both monitors and printers. We recommend this because the quality of results you get with this approach significantly exceeds the quality of results you'll get with a mid-range combined monitor plus printer calibrator solution like the ColorMunki (which is pretty good) or the SpyderPrint (which we've found to be not really very good at all). (If you're really experimental with your printing and want to try lots of papers, then the Munki is the best choice unless you have a much larger budget). To this end, we also include a free printer profile - normally $50 - with every monitor calibrator purchase over $200. This is so out of the gates you're using the best approach. So - the question then becomes - which monitor calibrator to buy? There are two answers - the budget answer, and the best answer. Basically, if you want the cheapest option that is any good, you'll be spending around $200. For significant improvement, your budget will climb to $300+ - but you'll get a much better, more accurate device and much better future proofing as well. The best answer is the i1Display Pro (around $350) from Image Science, with our unlimited lifetime product support. It's without doubt the most accurate calibrator on the market at a reasonable price, highly reliable, easy to use, and compatible with every major after-market system for calibration you might find yourself using in the future - including Eizo's ColorNavigator, NEC's Spectraview 2, BenQ's PaletteMaster (inc. PM Elements), ArgyllCMS/DisplayCAL, and TV/video calibration systems like CalMAN, Lightspace CMS, and so on. It is the industry standard calibrator, and the one we recommend to all folks who have the budget for it - we consider it an utterly essential tool for good results with digital imaging. If the budget is tight, though, then the best budget answer is probably a Spyder5 Express (around $200) - but used with the free after-market DisplayCAL software - this is because the included Spyder5 software is not great at all, and it 'software limits' the Spyder5 Express unit to be far less good than it actually can be. 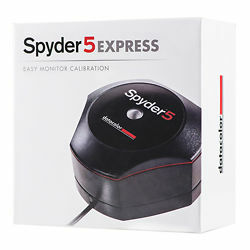 DisplayCAL treats the Spyder5 (or rebadged Spyder 5s, like the Eizo EX3) as a full Spyder5 sensor, without artificially imposed limits on settings etc, and is thus the the vastly better software option for use with the cheaper members of the Spyder5 series. That said, we generally think this cheaper option is a false economy in the long term. The Spyder5s just don't seem to last as long as the i1Displays (see below), and it's very common for folks on their imaging journey to realise they need a better monitor as part of their long term progress. And better monitors need, and deserve, better calibrators. So very often spending $200 now means spending $300+ again later - and so we think it is generally better to simply spend the ~$350 initially and get the right device first. Buy once, buy right. What About The Spyder5 Pro and Elite? Quite frankly neither the Spyder 5 Pro or Spyder5 Elite make any sense to us at their current pricing (the Spyder5 range came in at 35% more expensive that the Spyder4 range!). The current pricing is, frankly, nonsensical when compared to the i1Display Pro's pricing. We'll get in to more detail below, but the Spyder5Pro (~$320) is very nearly the price of the i1Display Pro - and we find it significantly worse in both quality and features. The Spyder5Elite is a near match in features, but still not as accurate, and considerably more expensive than the i1Display Pro at ~$475. It is, quite simply, just very much overpriced. What Makes The i1Display Pro The Best? 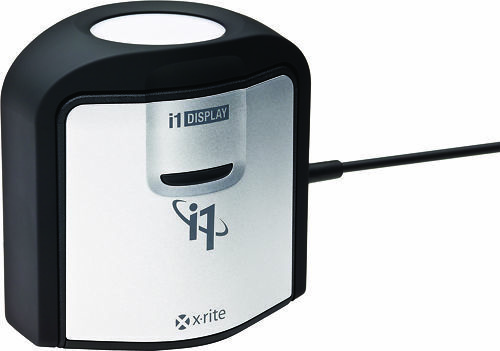 The i1Display Pro is, we think, the best monitor calibrator that's ever come along & offers an absolutely great level of performance for it's cost (noticeably lower than previous pro level calibrators). Accuracy - every decent test we've ever seen, and our own testing, shows the i1 to be a distinctly more accurate sensor than the Spyder range, particularly in deep shadows. When compared against lab grade meters (those which mere mortals cannot afford! ), the i1 holds its own remarkably well. Profile Quality - it is not uncommon for Spyder5s to induce banding post calibration, particularly on lower quality displays. It's not unheard of with the i1Display either, but we've found the smoothness in such situations is always noticeably better with the i1Display. Repeatability/Longevity - the i1Display Pro uses a sealed design, and very high quality dichroic filters. We have a unit from 2012 here and we can as yet not detect any change in its measurement accuracy. Our own testing over many years, and anecdotal reports, indicate 2 to 3 years is the best you can get from Spyders - this is because they use more basic, exposed to the air filters, and those filters change their behaviour over time quite noticeably in our experience. Field Upgradeable - the i1 is a field upgradeable sensor - that is, it can be updated in the future for new monitor trends (or if a particular batch of calibrators shows some sort of trend in drift). Speed - calibration is (let's face it!) - boring, so you want it to be done fast (but still properly!). The i1Display Pro has a large light gathering lens - and because of this it can read colours more accurately, and more quickly. It takes about half of the time as the Spyders on average. Compatibility - as the industry standard professional colour measuring tool, pretty much all after-market software is made to be compatible with the i1Display Pro first and foremost. This includes all major monitor colour accurate vendors (Eizo, NEC, BenQ). Those vendors actively recommend the i1Display Pro as well - for example, Eizo tell us that the Spyder is incapable of individually measuring the R,G,and B gammas in deep shadows, leading to considerably poorer results in those deep shadows. The same goes for packages geared more at video editing such as CalMAN and Lightspace CMS - they're all compatible with, and recommend, the i1Display Pro. Price - only marginally more expensive than the distinctly inferior Spyder5 Pro, and vastly cheaper than the Spyder5 Elite - at around $350 it's just far better value than the Spyder5s. In all honestly, it's quite unusual that a choice between products is so clear cut - the i1Display Pro is simply the only sensible option in professional calibrators right now. The price, for beginners, can seem a lot, but what price can you put on accuracy? And sure, if you're using a really bad monitor you should probably upgrade your monitor first (see our Monitor Recommendations and Guide to High Quality Imaging Monitors) - but calibrators pay for themselves by stopping you wasting time making mistakes. A practical example - if you miss the white balance when processing your RAW files by just a few hundred Kelvin - and this is all too easy to do on common set-ups in common use like uncalibrated iMacs - then this is a colour error you're introducing to all your files, and one that is essentially uncorrectable in downstream corrections (and one that will be reflected in all your prints as a certain muddiness). If you want that sort of clean colour purity that top photographers achieve and that give their images the professional edge, you need calibration. Literally thousands of people have told me 'they're pretty happy with their screen to print match at the moment' and questioned whether they really need a good calibrator. And not one of those people has ever expressed regret to me after the purchase of a calibrator. Like any calibration device it takes some time and knowledge to get the best results from it, which is why we have an excellent and very popular guide for this calibrator. More importantly, when you buy it from Image Science you get our legendary lifetime support - you're welcome to email or call us at any point in the future with questions about your i1Display Pro. We've been offering this level of support for 15 years now and believe me - people can and do call on our support literally years later, for all sorts of reasons. Put simply - nobody knows these products, and their real word use, better than we do - we use them daily in our very busy fine art printing services here at Image Science, and we practise constant process improvement at all levels to make sure we're getting the absolute best out of our equipment - and you benefit from this pool of knowledge every time you draw on our articles or support. There are many other reviews out there comparing the Spyder range and the i1 on the web, and no serious review we've seen has ever concluded the Spyder5 is as accurate as the i1Display Pro, so don't just take our word for it - we encourage you to do your own research. If you trawl the AVS forums (which is where some of the leading cinema and home theatre installers/calibrators hang out), you'll see the actual developers of industry leading video calibration packages like CalMAN and Lightspace CMS directly comparing the two. (We can save you the reading though, they all conclude the i1Display Pro is the one to go for! ).